At Garage Pros we know that commercial garage doors may have to take the beating. This is why we build ultra durable, extremely tough commercial garage doors that can withstand the daily wear and tear relating to owning or operating the business. 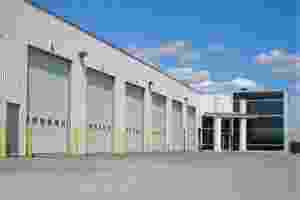 Our company has the complete selection of safety and performance tested industrial and commercial garage doors including the high performance steel garage doors. Garage Pros manufacture different styles of commercial garage doors to cater to your business needs. We have insulated garage doors, non-insulated garage doors, both for internal and external applications. Our range of commercial garage doors is truly impressive right from section steel doors and high performance doors to the fire-rated ones. Each of the doors we have is engineered for excellence and also backed by the nationwide network. Garage Pros is the premier choice for superior serviceability, durability and hassle free performance of garage doors. Contact us to Today Request for a FREE Quote. Looking for commercial garage door repair services? Choose Garage Pros for all the garage door repair needs. We mainly service Calgary and surrounding areas. When it comes to securing your business place, you totally depend on your garage door. Only when the garage door functions properly, it can secure the business place. We are mainly focused on offering new garage doors and providing installation and repair services. No matter what brand or model of commercial garage door you use, you can get in touch with us for a complete line of service. We are the specialist you actually require for the garage door installation and repair services. Right from steel rollers and overhead doors, sectional doors, sandwich doors to ribbed steel doors, we can service all. You can call us to discuss out your needs. We can install fresh commercial door and repair various kinds of doors including rolling steel, sectional and rollup. When it comes to the commercial garage door, the major problem it faces relates to the garage door opener. If the opener of the door gets broken or malfunctions, the door will not open or close smoothly. However, there is nothing to worry as our technicians can help you out. They are licensed and experienced in carrying out all kinds of repairs with respect to commercial garage doors. Our team of professionals are trained and qualified in the task. We also carry insurance to cover all the risks. So, get your commercial garage door repaired or replaced promptly by choosing us. Garage Pros takes pride in offering fast, effective and reliable garage door repair and replacement service. We offer services for all 24X7 hours. As 100% satisfaction is guaranteed, you must contact us now.